Acquire a profitable pet boarding grooming and Daycare Company located in Ontario. The company is well established, having been in business for nine years. The business enjoys consistent revenue and has the potential to bring in even more cash with the opportunity to add new pet boarding spaces and to offer additional services. The business is built on almost 2 acres of land and there is enough vacant space to expand the business on. Included in the facility is a living space for accommodations. This living space even has a beautiful balcony that is decked out with a hot tub. The business already has six trained employees onsite who will provide exceptional service for the customers. Three of these employees work full time in the business and the other three are currently part-time employees. The business day usually runs for thirteen hours per day. The business opens at 7 in the morning and usually closes its doors at 8 in the nights. Employees are appropriately assigned hours to fit into the 13 hour workday. The price being requested for the business is C$999,000.00, this price will cover everything. It will pay for the entire building and business and also the land which it sits on. The business usually earns about C$300k per year. With the potential for expansion you can increase this number significantly. If you are an animal fanatic who will enjoy working with dogs and cats all day, this can be a very fulfilling experience. The location is clean and well kempt and the nice outdoor setting will make for a very enjoyable and relaxing workspace. If you are new to the pet care business we will ensure that you get adequate training in order to prepare you for owning and running the business. The nine year old business currently has 6 employees. The business is open every single day of the year and runs from 7 in the morning until 8 in the nights. The business provides a safe place for pets to spend the day or board for longer periods. 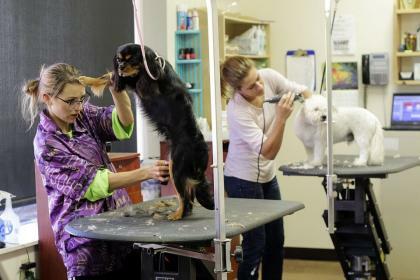 The employees are also skilled professionals who carry out amazing grooming jobs for the pets. There is enough space to accommodate new boarding areas to attract even more revenue. The products and services can also be expanded on. For example you can offer other relevant services within the pet care industry such as dog walking etc. you can also offer products that the customers might need for their pets. The business is built on a little less than 2 acres of land. One acre of the land is being fixed to be utilized otherwise. 5400 square feet of the land consists of the accommodation area that has two bedrooms and two bathrooms. The living area has an attractive balcony with a hot tub. No experience is necessarily needed to run the business. You just need to have a passion and drive. The current owner will offer all the help needed to guarantee a smooth transition into the new business. The owner will continue to provide support until you are comfortable with operating the business on your own.